Matzo brei is a traditional Jewish dish often served during Passover. 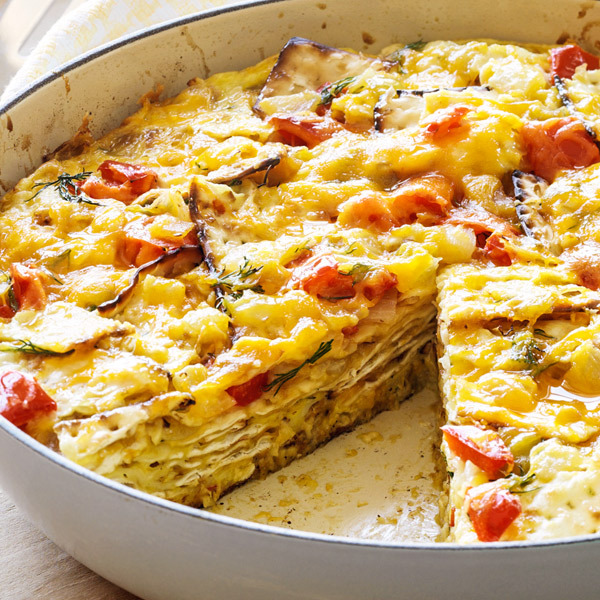 Our savory matzo brei recipe features matzo, eggs, onion, red pepper, cheddar cheese and fresh dill scrambled in a non-stick skillet and then broiled to crispy, cheesy perfection. Serve this popular dish in generous wedges for a tasty Passover breakfast or brunch option your guests will love. In large, nonstick skillet, heat 2 tablespoons oil over medium heat. Add onion and bell pepper, and cook until onion is tender and beginning to brown, about 10 minutes. Place matzo in colander and rinse with warm water until evenly moistened. Drain. In large bowl, whisk together eggs, salt and water. Add drained matzo, ½ cup cheese, onion mixture and dill. Stir to combine. In same skillet, heat remaining 1 tablespoon oil over medium-low heat. Add egg mixture and press to smooth. Cover and cook until bottom and sides are set, about 10 minutes. Preheat broiler. Sprinkle with remaining ¼ cup cheese and broil 3 minutes or until top is lightly crisped and cheese has melted. Slide onto plate and cut into 6 wedges.